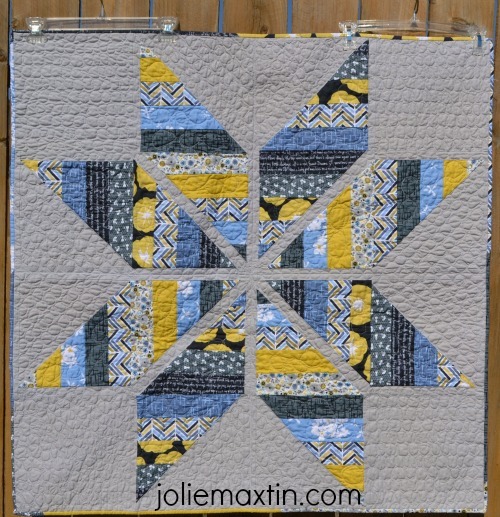 Jolie Maxtin: Madrona has crossed the finish line! As many of you, who are Modern Quilt Guild members know, we recently had a challenge using Violet Craft's Madrona Road Fabric. At my quild we got fat quarters and were to asked to make a quilt with them. The pattern I used was out of a Quiltmaker magazine and I thought it would showcase the fabrics nicely. Now usually, I send my quilts out to be quilted, but since the deadline to show this was fast approaching and frankly, can you call yourself a quilter if you don't quilt? (I have for a good long time, but I still ponder the question). It was time to step up and just do it. After all, my machine can handle it, I should be able to also. The pebble quilting design is one I have always admired so I just went for it. In full disclosure, prior to this sudden motivation, I had drawn one inch lines in all the gray space as I thought straight lines would be easier. That thought was quickly abandoned after I stitched, just one, line. I ripped it out and pebbled my little heart out. For any future pebbling, the one inch lines are worth the time, to create guidelines to quilt in between. My machine has a BSR so I plugged it in and went to town. First I was only going to do one corner, then two, then just one triangle section. It was sucking me in! I just kept going and going. Then....my machine decided she needed some juice. Ugh, not now, just a few more areas. No, she needed her juice now. So I gave her some oil, per her request and you know what, she decided she wanted to do something else. The nerve!! I couldn't get the tension right to finish and I didn't just have a few eyelashes, I had full on bird's nests. So..... she got abandoned for the evening. The next morning I did some piecing and then came back later with the BSR to finish. Humming right along now. Big sigh of relief. After the Madrona finish, the thread got swapped out and I moved on to the Skillbuilder blocks. On a personal note: I found this post by Violet Craft very moving as she talks about designing this line and what it means to her. congrats on conquering the pebbles. It is so much more controlled than I ever do and looks great. smart to walk away when things go wrong with tension and I'm glad they hummed along. I LOVE your Madrona Road project! The stone background really tempers the bright yellow of some of the challenge fabrics. And I love the fractured star. Sweet! This is just beautiful. I have a BSR and have enjoyed using it. Now, I'm going to go read Violet Craft's post! I love the quilt! And that line of fabric is so gorgeous! And that quilting is pretty fantastic! I love your quilt! I haven't tried pebbling yet but maybe if the new machine here works out (I still haven't received an email verification - COME ON JANOME!) I will give pebbling a try.